GoDaddy is a platform where people can purchase a domain name or website address. The company bills itself as the world’s largest cloud platform dedicated to small, independent ventures. It currently has almost 17 million customers worldwide and over 71 million domain names under management. Many of its customers are small and medium business owners who may need guiding in their foray into the digital space. This is why it has launched the Website Builder for Filipino business owners. GoDaddy’s new Website Builder makes it easy for business owners to optimize their website for mobile or adjust its appearance with the right proportions when viewed in mobile devices. The Website Builder also has an integrated set of online marketing and e-commerce tools, in case entrepreneurs want to attract visitors to the website and sell their products or services online. There is now an undeniable 88-percent adoption rate of mobile phones in the Philippines and small to medium businesses should capitalize on this. GoDaddy’s Website Builder helps websites become fully responsive and give instant visual impact on phones, tablets and computers. It also makes sure that the user interface or the overall look of the website is professional yet can be done under an hour, even with the use of a mobile phone. So how can people get started on Website Builder? Business owners in the Philippines can go to the website and type in their industry or sector. 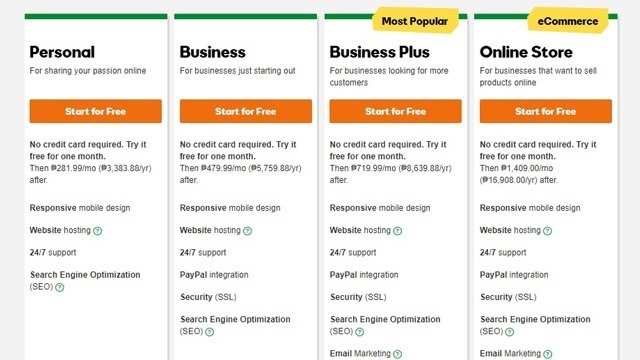 The range provided by GoDaddy is wide, with more than 1,500 business ideas or industries, from trades to real estate and even hairstylists. The Website Builder’s smart learning system produces a near-complete website, pre-filled with relevant sections and professional images optimized for a desktop computer and for mobile devices. 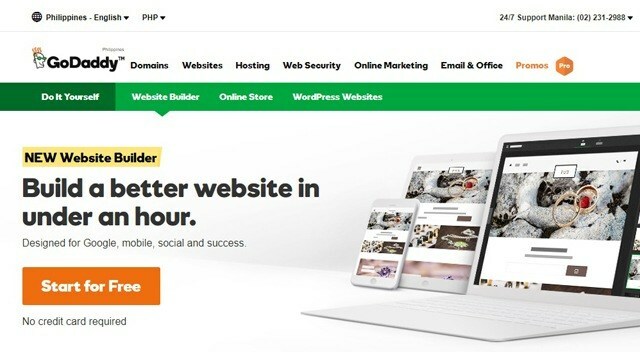 GoDaddy Asia Vice President Roger Chen said that GoDaddy’s new Website Builder is changing the approach to website creation. “This new approach is unique as it helps customers reach their audiences and drive real business results and customer insights, all from the convenience of their mobile phone,” he said. The Website Builder has several features which make it ideal for business owners who may not have a background in website creation or design. Mobile editor: The new Website Builder’s mobile editor enables users to build and update their websites on-the-go. Owners can customize their site designs, upload new photos from their phone or add special events or holiday hours, easily keeping their site fresh. They don’t even need to download another mobile app to create the website; everything is right there. GoDaddy's smart learning system: The smart learning system surfaces insights and actions for the users to help them achieve their goals. For instance, upon logging in, customers receive engagement and activity updates to improve results, like visits or sales, in a dashboard view. Further advice for attaching their website to a social network will be shared to help amplify their online presence and reach more audiences to help drive real results. Integrated marketing solutions: This enables small businesses to quickly improve their Google search rankings and help jumpstart email marketing campaigns. This means even those with no email marketing experience can powerfully engage with both existing and potential customers. Social media integration: Social integration allows users to link their website to Facebook, Twitter and other social media platforms, integrating social media capabilities into their marketing campaigns. According to Chen, the Website Builder is helping customers get noticed, reach larger audiences and grow their businesses. “With GoDaddy’s new Website Builder, small businesses in the Philippines can create powerful online identities that help them thrive,” he said.